Busy Bees at Mitchelton features beautifully designed open plan rooms and spacious outdoor settings tailored for each age group. You will find timber forts, tipis, sandpits and beautifully planted areas where children are encouraged to ignite their curiosities and sense of discovery. Patricia Crofts has been appointed as Service Manager and brings with her 15 years of commitment and experience in early learning. Patricia is supported by a team of ten teaching practitioners with the Service offering 94 spaces for children. Conveniently located in the heart of Mitchelton on Sussex Street just a hop, skip and a jump away from Brookside Shopping Centre, the Service was developed to ensure that children are being provided with exciting opportunities. Jam packed with challenges for them to play and grow in an innovative and stimulating environment, Busy Bees at Mitchelton is a safe place where your child’s individuality can be nurtured by dedicated Teaching Practitioners and Educators. Busy Bees at Mitchelton encompasses an innovative approach which is based on the discovery and exploration of respectful relationships with children. We follow this philosophy and offer children uninterrupted time for play, plenty of freedom, a calm and relaxed environment, cooperative relationships, and our full attention. We would love to have you join our Busy Bees family at Mitchelton. I have over 15 years experience in developing centres across Australia. Throughout my professional development within the Early Childhood sector I have never looked back, it is my belief that the early years are where a foundation is laid to set the best possible start for all our children. I work with a determination to exceed in all quality areas and I am certain that it is a strong and enthusiastic team that will accomplish this. This can be achieved by implementing intentional teaching practices with a holistic approach and listening to the voices of our children. In doing this we can extend on individual observations and ensure that there is always an experience available to suit every childs needs. This enables them to develop their unique strengths within, creating a curious and confident child. This has encouraged me to complete all stages of training from Cert III, Diploma to Bachelor of Teaching in Early Childhood. I have continued with enthusiasm to complete a certificate in Special Needs and believe that all children have the right to feel included as they develop in a safe, secure and exciting environment where they feel they belong. Thus enabling them to reach milestones at their own pace and develop their own unique personality. To ensure I am able to support my team to achieve their goals I have continued to study and gained a certificate in Training and Assessment. This aids me in the effective mentoring of all team members, encouraging them to reach their full potential and instilling an attitude of continuous professional development amongst the team. I have an open door policy and welcome all families to the Service, I believe that a centre that is focussed on community spirit is a place where children thrive and be who they want to be. 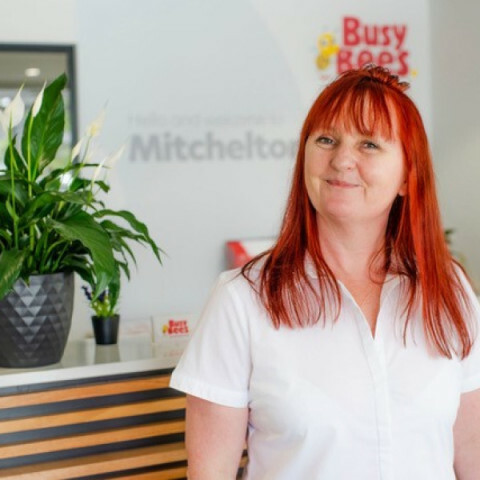 Please feel free to stop and discuss any ideas you may have, to ensure that Busy Bees Mitchelton is the best possible place for all your child’s needs.